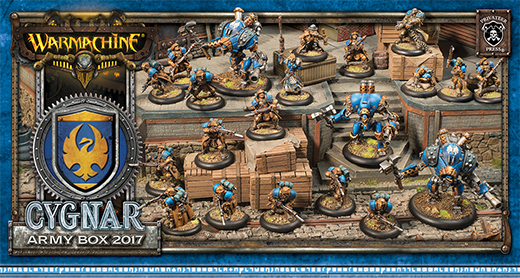 Privateer Press: March is in full swing, and along with lions, lambs, and Ides, this month also sees our 2017 Army Boxes marching on with the release of new Army Boxes for both Cygnar and Retribution of Scyrah. Each of these Army Boxes contains a ready-to-play 50-point army, designed by the Privateer Press Development team to provide a solid foundation for new players or for veterans interested in diving into a new Faction. While the last couple of Army Box pairs have each contained a similar theme in composition, this month we present two very different takes on the art of Warmachine.